Nautimages' aerial footage from Friday's multi-class coastal Raid. Over the last five days, the Kitefoilers sailed 12 races, including a 26 mile coastal 'Raid' yesterday. 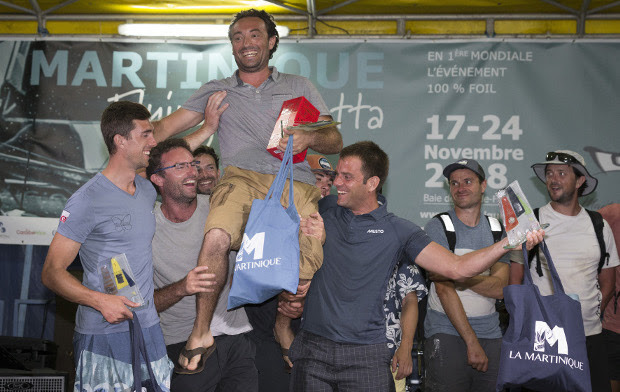 Across all, Mazella maintained his perfect scoreline as Le Borgne finished second, ahead of Vendée Globe skipper Morgan Lagravière. "I am so pleased!" said a beaming Rezzoug. "I have been sailing Moths for 100s of years and this is my first big victory. Today I won the first race, but the second was more difficult because I capsized right after the bear-away when I was in the middle of the pack." Swiss sailors took second and fourth place with the latter, former Whitbread Round the World Race crew and professional photographer, Philippe Schiller claiming the last race. "Today was much better than the beginning, when I kept capsizing," he said. "I loved the reaching starts, because timing and speed have to be precise. I can sail very low downwind - every time I was leading at the bottom mark, but in the first race I capsized because I was too tight. It was very close with Aymeric [Arthaud] who was a point ahead of me." Of the event Schiller added: "I am always interested in events where there is wind. Plus to sail in 30°C air and water temperatures - you never feel cold! You couldn't ask for more." 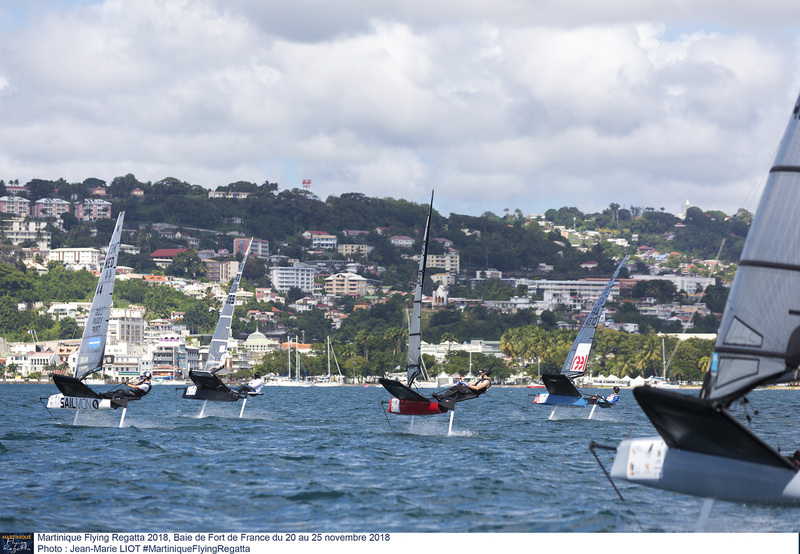 "It's been strange because I have been struggling to be as fast as Guillaume, who has won all of the windward-leewards over the last three days," admitted Villion. Pirouelle lost the series following his disappointing fifth in the triple points-scoring Raid. 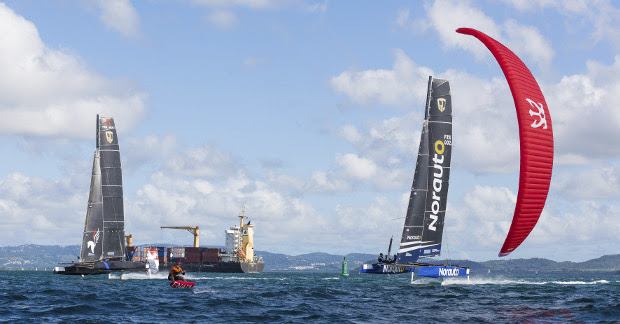 This has been the first major event for the Moth-like one design singlehanders. Villion said they had made good progress. "You can see the improvement in the racing. The first day was a mess and today and yesterday were much better. I'd love to come back next year. 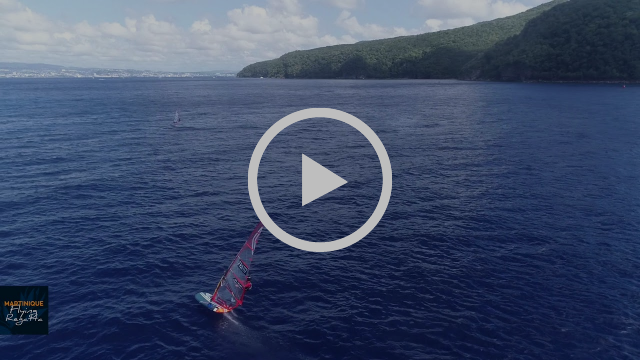 This is the perfect place to sail foiling boats with flat water and warm weather." "I am happy to win this first edition of this new race,"said Caraes. "It was a good event with wind every day. Today the wind wasn't as strong, but it was still good and I conserved my first place overall, which was my objective." One of France's powerful Olympic RS:X Women's team, Hélène Noesmoen finished fifth overall in the Windfoil class. "It was an amazing event with lots of sailing and good weather every day – windy, sunny and warm. On the long distance yesterday, the landscape was amazing and the long waves were nice to surf. I have never sailed in waves like that."